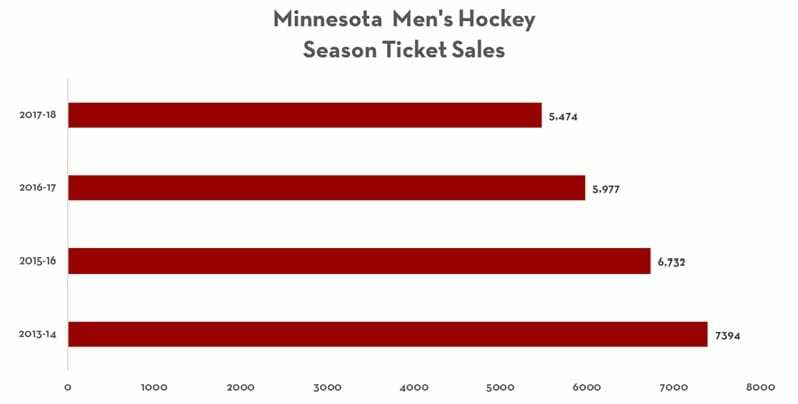 Minneapolis, Minn. — Gopher men’s hockey season ticket sales for 2017-18 are down eight percent with 5,474 tickets sold compared to last season’s 5,977. The number continues a downward trend for sales since their first year in the Big Ten when the university sold 7,394 season tickets. Minnesota men’s hockey ‘pick-your-pack’ tickets went on sale Tuesday to Gophers Score members and will go on sale to the public Wednesday. GopherPuckLive has tracked season ticket scanning data since the move to the Big Ten with recaps in 2015, 2016, and 2017. The data shows the number of tickets distributed nears the capacity of 10,000 for most games, however actual attendance recently has been around 70 percent. Season ticket sales have declined since that first year in the Big Ten with 6,732 in 2015-16, 5,977 in 2016-17, and now 5,474 in 2017-18. The Gophers men’s hockey schedule this year does not feature North Dakota coming to Minneapolis, which was the most hyped game last season with single game ticket prices between $100-$130. Wisconsin was the most attended game last year, and carries with it the top tier price of $70/$60/$55 this season. St. Cloud State’s lone visit and Notre Dame’s first visit as a member of the Big Ten are the next tier at $60/$55/$50. 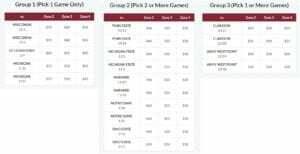 The third tier is Michigan’s conference visit at $55/$50/$45, the rest of the Big Ten games including Penn State, Michigan State, Ohio State and Harvard will cost $40/$35/$30. The final tiers are Clarkson $35/$30/$25 and Army $30/$30/$25. Single game ticket pricing in 2015-16 was $50/$45/$40 for Michigan, Wisconsin, St. Cloud St., and Minnesota State. 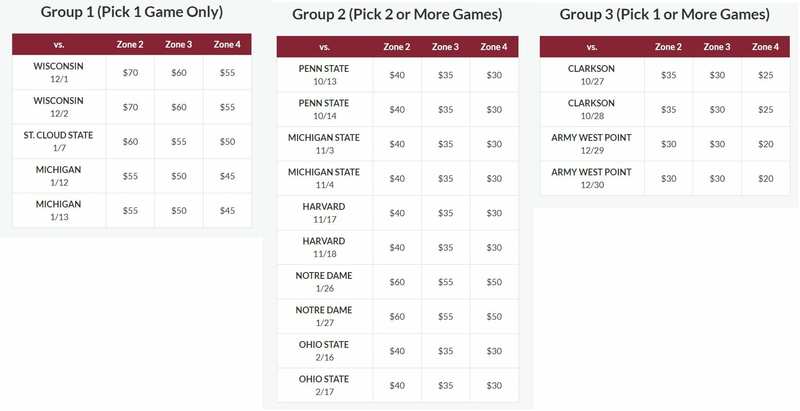 Ohio State, Penn State, and Michigan State were $40/$35/$30, and Mariucci Classic games were $30/$25/$20. 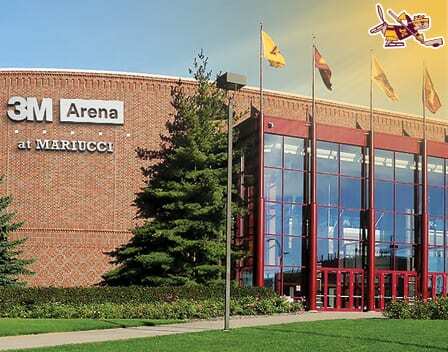 Season ticket holders told department officials they have wanted to see their Gophers play on Friday and Saturday nights, and continue seeing opponents they were familiar with from the WCHA. Minnesota has North Dakota signed to a four-year scheduling agreement, and Minnesota Duluth to a four-year series over five seasons, and they have St. Cloud State and Minnesota State on the schedule through at least the 2017-18 season. A fan relations board has been formed this past year and will continue to provide feedback. 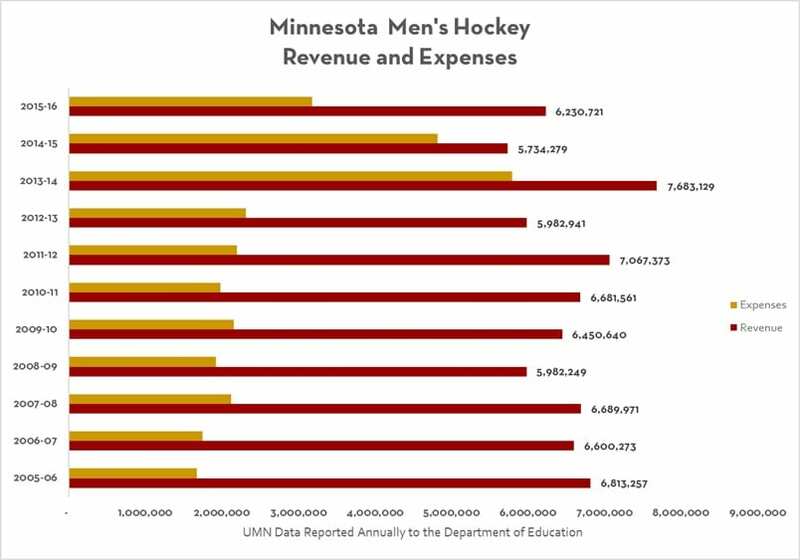 The University of Minnesota is the national leader in revenue associated with its men’s hockey program in 2015-16 at $6.230 million ahead of University of Wisconsin’s $4.797 million, University of North Dakota’s $4.501 million, Boston University’s $4.447 million, Colorado College’s $4.413 million, and Penn State’s $4.411 million according to data submitted to the Department of Education. 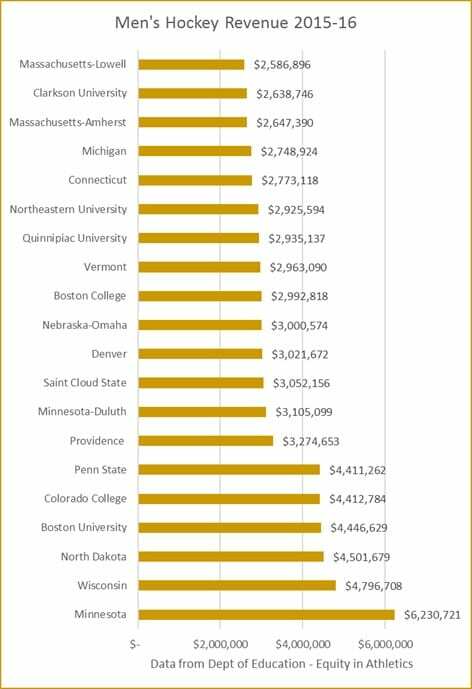 The program has also consistently been a revenue generator for Gopher Sports with at $3.055 million excess last season and an average excess of $3.689 million over the last decade.